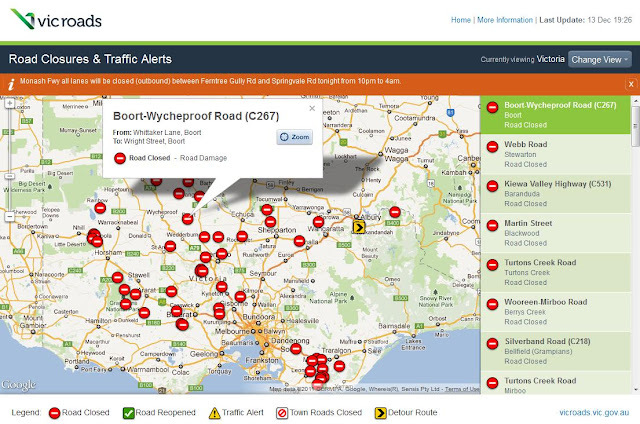 Last week VicRoads announced the launch of Road Closures and Traffic Alerts application. Media release issued by the Victorian Minister for Roads, The Hon Terry Mulder MP, provided background information on the project. In particular, Road Closures and Traffic Alerts is a $924,000 initiative to provide real-time information about detours and traffic incidents, such as crashes and breakdowns, as well as road conditions during emergencies. 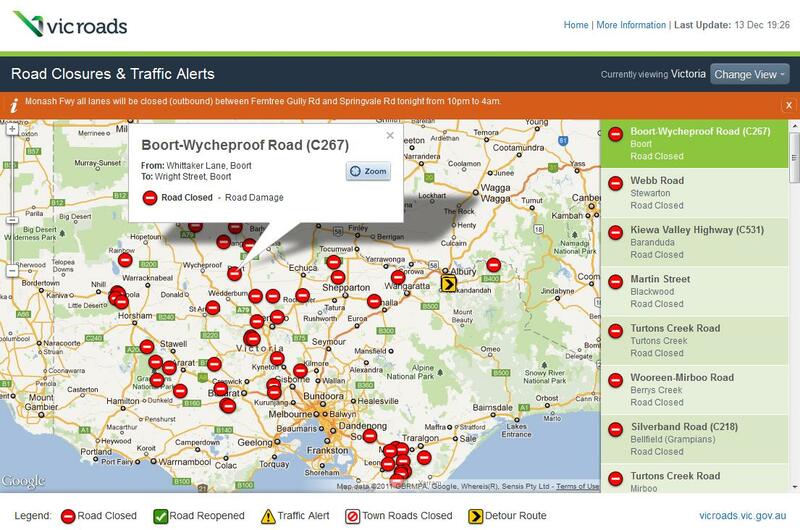 VicRoads will update information as it receives it from its own staff and agencies such as Victoria Police, Country Fire Authority or local government. The map-based application is accessible online and can be viewed on web-enabled mobile phones. Alerts will also be published via Twitter (but unfortunately there was no mention of RSS version). Built with Google Map API, the application offers very familiar user interface and very simple, clean design. The list of published incidents is optimised to show only minimum detail (ie. street name, location and type of the incident) and full information is only displayed in pop-up windows on the map. Sections of closed roads, as well as available detours, are marked on the map with blue lines (visible on closer zoom), adding to clarity of presented information. The only limitation is that data is not refreshed automatically and requires manual reload to show the latest incidents.